TORONTO — Health Canada is looking into whether two cannabis companies’ sponsorship of a children’s charity event last October is in violation of promotion restrictions within the Cannabis Act. Cannabis sector companies Canopy Growth Corp. and Halo Labs were among the sponsors of an Oct. 23 event in support of Kids, Cops & Computers for the Merry Go Round Children’s Foundation, whose honorary chairman is federal Organized Crime Reduction Minister Bill Blair. During the annual event called Inspiration Night, held in Toronto, the cannabis companies’ logos were used in a poster of sponsors and other materials, according to pictures posted by the non-profit online. A Health Canada spokesman says the Cannabis Act does not prohibit the sponsorship of a person, entity, activity or facility but that sponsorship cannot be used to promote cannabis and it is prohibited to display a brand element of cannabis. “We are gathering facts and information about the situation to determine whether there may be an instance of non-compliance with the promotion prohibitions in the Cannabis Act,” said Health Canada spokesman Geoffroy Legault-Thivierge in an email. He added that Health Canada has followed up with the company to ensure it is aware of the promotions prohibitions, and it understands that the Foundation has removed the names of the cannabis companies from the list of sponsors on its website. Under the Cannabis Act, that came into effect when Canada legalized pot for recreational use on Oct. 17 last year, there are strict guidelines on promotion and marketing. Those include a ban on promotion that is appealing to youth, and sponsorship of people, events or buildings. However, approaches between licensed producers in the months since legalization have varied and some industry players have said that reflects uncertainty on how to interpret murky portions of the act. The act stipulates that it is prohibited to display, refer to or otherwise use a brand element of cannabis directly, or indirectly, in a promotion that is used in the sponsorship of a person, entity, event, activity or facility. As well, it is prohibited to display the name of a person that produces, sells, or distributes cannabis, sells or distributes a cannabis accessory or provides a service related to cannabis. Merry Go Round’s president Mark Zwicker said at the time of the event, the Cannabis Act was so new it wasn’t clear whether brand elements could be used. The charity has since removed the logos from its website, he said. “It’s a grey area and we don’t want to do anything that would materially affect the charity… I can assure you that no one that was involved with the charity would have knowingly taken any action that would contravene the act,” Zwicker said. Canopy Growth said it is not prohibited from sponsoring an event as long as cannabis is not promoted. Halo Labs and Bill Blair did not immediately respond to requests for comment. The sponsorship portion of the Cannabis Act does have some “grey areas,” such as whether a holding company would be subject to the sponsorship restrictions, said Ottawa-based lawyer Trina Fraser. “In and of itself, it is not a producer or distributor of cannabis, its subsidiaries are… I think there is still some greyness around that,” she said. 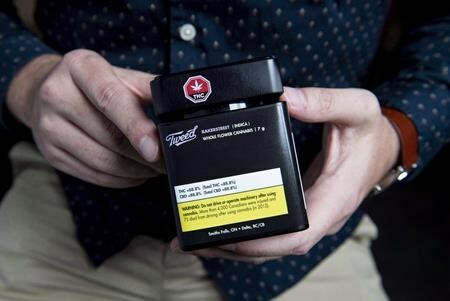 However, the act says it is prohibited to use a trademark or brand name slogan that evokes or is reasonably associated with cannabis, said Toronto-based lawyer Matt Maurer. When reviewing regulated activities under the act, Health Canada considers each situation on a “case by case-basis,” said Legault-Thivierge. “A range of factors including, but not limited to, the purpose of any promotion, its content, its context, and its intended audience would be assessed when enforcing the prohibitions on promotion in the Cannabis Act,” he said. TORONTO — When cannabis supply at Small Town Buds begins to dwindle, co-owner Chris Felgate shuts the doors of his Devon, Alta., shop and turns customers away. Even though the legal retailer often still has oils and capsules in stock, most shoppers are looking for the store’s namesake product, he said. “Having our doors open with no flower available was making customers more angry… It’s like going into a grocery store and not having groceries,” he said. Since he first opened his doors on Oct. 17, the closures became a near-weekly ritual as demand outstripped the supply he was able to procure from the provincial government distributor, he said. The situation began improving in March, however, after the Alberta Gaming, Liquor and Cannabis agency added additional suppliers, and he has kept his doors open consistently since. But the weekly supply he receives still lacks in selection and quantity, Felgate said. It has been six months since Canada became the first industrialized country to legalize recreational cannabis, in a bid to stamp out the illicit market. On that landmark day, high demand resulted in lineups at the few bricks-and-mortar stores that were ready, delivery delays and stock outs. Licensed producers ramped up production in anticipation of Oct. 17, but product was scant and many companies pointed to supply chain issues as a major cause of the bottleneck. And on this 4-20, the first annual celebration of cannabis culture post-legalization, many pot enthusiasts are still smoking joints they did not buy through legal channels. The vast majority of cannabis, or 79 per cent, was bought illegally in the fourth quarter, according to Statistics Canada, down from 90 per cent in the third quarter. Legal sales of dried flower across Canada in February were down 8.8 per cent from January, partially due to a shorter month, but average daily sales of dried cannabis in February remained relatively flat, up one per cent from the previous month. Meanwhile, inventory of dried cannabis products which are finished — meaning packaged, labelled and ready for sale — at cannabis companies rose by more than 19 per cent to 12,110 kilograms in February. The amount of unfinished dried cannabis held by licensed producers increased to 120,731 kilograms, up 4.1 per cent from January. Based on industry figures, there is enough cultivation space to produce approximately one million kilograms of pot per year, she added. Allan Rewak, the executive director of the Cannabis Council of Canada, said much of that unfinished inventory is product unsuitable for sale to consumers. As well, licensed producers face various regulatory hurdles such as obtaining necessary licenses for processing product that does meet the bar, he said. Aphria Inc. sold less cannabis to recreational users during its latest quarter ended Feb. 28, compared with the previous one, due to supply shortages and packaging and distribution challenges. But Bruce Linton, co-chief executive of Canopy Growth Corp., said it has ramped up the amount it can package and ship, from roughly 300,000 units in October to 1.3 million in March. With automation and new equipment, output is getting better, but as more stores open their doors demand grows, he said. “The equation keeps evolving… It’s not a static market,” he said. Several provincial government retailers and distributors say they have seen marked improvement in recent weeks, but supply remains an ongoing challenge. Many of these provincial entities have signed on additional licensed producers to boost supply as Health Canada gives more companies the green light to cultivate and sell. In B.C., the Liquor Distribution Branch has been receiving a larger share of the amount ordered from suppliers compared with the initial weeks of legalization, according to spokeswoman Kate Bilney. Manitoba Liquor and Lotteries is receiving, on average, about 30 per cent of the product it is expecting each month, spokesman Lorne Kletke said. In Quebec, supply is getting better “week by week” and the Societe quebecoise du cannabis expects significant improvement by the end of spring, said spokesman Fabrice Giguere. But the crunch is “not over yet,” and its outlets will remain shut on Mondays and Tuesdays, he added. Cannabis retail chain Fire and Flower is seeing a boost in supply, but at a slower rate than expected, said its chief executive Trevor Fencott. The company — which has stores in Alberta, Ontario and Saskatchewan — is seeing more product from the latter province which has a more efficient, private distribution model, he said. But even when legal retailers are stocked up, price remains an issue. The unweighted average price of a legal gram of dried cannabis is $9.99 per gram, compared with the average illicit price of $6.37 per gram — a price gap that appears to be widening, according to an analysis by Statistics Canada of submitted price quotes. Regular cannabis users are unlikely to make the switch until the price of legal cannabis becomes more competitive, said Fencott. He points to Colorado where prices have dropped dramatically since legalization, at the expense of illegal dealers. Legalization at a national scale is a massive endeavour, and things will improve, in time, he said. The Kentucky Republican represents a state that for generations was a leading tobacco producer in the U.S. But tobacco production — once an economic lifeblood in rural Kentucky — has dropped dramatically for more than a decade in the state. McConnell said his bill will continue to hold retailers responsible for verifying the age of anyone buying tobacco products. His office said 12 states have already enacted laws raising the minimum legal age to 21. McConnell made the announcement at the Foundation for a Healthy Kentucky in Louisville, an organization that promotes health initiatives. The senator said he intends to introduce the bill next month. Smoking, the nation’s leading cause of preventable disease, is responsible for more than 480,000 deaths each year. Smoking-related illness costs to society exceed $300 billion each year including $170 billion in direct medical costs, according to the Centers for Disease Control and Prevention. As of 2017, about 34 million American adults smoked cigarettes, and every day about 2,000 youngsters under age 18 lit up their first cigarette, it said. McConnell’s home state is plagued by high cancer rates connected to smoking. The Kentucky Republican has been a key player in tobacco-related legislation before. 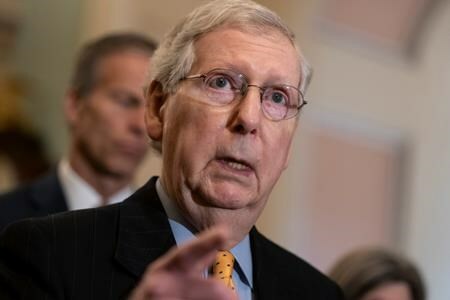 More than a decade ago, McConnell helped win the multibillion-dollar tobacco buyout, which compensated U.S. tobacco growers and others for losing production quotas when the government’s price-support program ended. McConnell said Thursday he considers teen vaping to be the “most serious threat” his new legislation will seek to combat. Vaping is an electronic form of smoking. “For some time, I’ve been hearing from the parents who are seeing an unprecedented spike in vaping among their teenage children,” McConnell said. The CDC said earlier this year that the vaping boom is the most likely reason that cigarette smoking rates among U.S. high school and middle school students has flattened in the past three years, after declining fairly steadily for decades. Among officials joining McConnell at the announcement Thursday was former Kentucky Democratic Congressman Ben Chandler, now president and CEO of the foundation. Chandler said raising the minimum purchase age is an effective way to reduce smoking rates. According to CDC data, about 8 per cent of high schoolers said they had recently smoked cigarettes in 2018, and about 2 per cent of middle schoolers did. Those findings were about the same seen in similar surveys in 2016 and 2017. It also found that about two in five high school students who used a vaping or tobacco product used more than one kind, and that the most common combination was e-cigarettes and cigarettes. Also, about 28 per cent of high school e-cigarette users said they vaped 20 or more days in the previous month — nearly a 40 per cent jump from the previous year. The CDC findings came from a national survey conducted last spring of more than 20,000 middle and high school students. It asked if they had used any tobacco products in the previous month. Kentucky lawmakers rejected this year’s state initiative to raise the minimum legal age for buying tobacco products to 21. That bill had support from the tobacco industry, including Altria, one of the world’s largest tobacco companies, which bought a $13 billion stake in the vaping company Juul in December.